Product prices and availability are accurate as of 2019-04-09 14:32:19 EDT and are subject to change. Any price and availability information displayed on http://www.amazon.com/ at the time of purchase will apply to the purchase of this product. ES948CX Finish: Satin Nickel, Optional Accessory: Without Pop Up Drain Features: -Bathroom sink faucet. -Matching finish drain included. 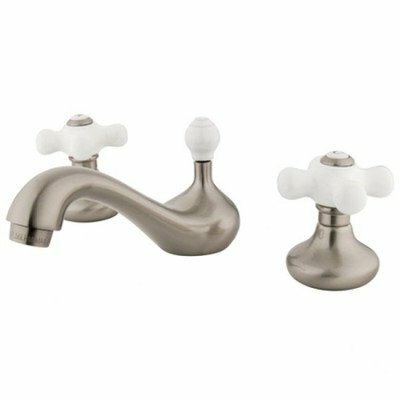 Product Type: -Standard bathroom faucet. Hardware Material: -Brass/Stainless Steel. Generic Specifications: -Compliant with low lead content requirements of California AB-1953 and Vermont Act 193. Dimensions: Overall Faucet Height: -2". Overall Faucet Width: -11.63". Overall Faucet Depth: -7.88". Maximum Faucet Centers: -16". Spout Height: -11.63". Spout Reach: -7.88". Optional Accessory With Pop Up Drain - Overall Product Weight: -9 lbs.